We’d love your help. Let us know what’s wrong with this preview of Waterloo by Bernard Cornwell. To ask other readers questions about Waterloo, please sign up. too bad Richard Sharpe won't get credit for his Daring-Do. lol/. Eddie Oh Sharpe is there! Cornwell does nothing new here. And he even asks himself the essential question: why another book on Waterloo? His answer is simple: he wants to tell the story himself. There’s no shortage of books written on it, and he has even written a fiction novel centred on it, but he wants to cast his voice out there to examine the facts. Cornwell has previously written only historical fiction, no non-fiction, so I was excited to see him try his hand and something a little bit different. And it’s a terrif Cornwell does nothing new here. And he even asks himself the essential question: why another book on Waterloo? His answer is simple: he wants to tell the story himself. There’s no shortage of books written on it, and he has even written a fiction novel centred on it, but he wants to cast his voice out there to examine the facts. Cornwell has previously written only historical fiction, no non-fiction, so I was excited to see him try his hand and something a little bit different. And it’s a terrify foray into the genre. I’d love to see him do it again, perhaps on Arthurian Britain. I digress here, but the point is Waterloo was a terribly important battle that shaped much of the nineteenth century. Imagine if Napoleon has won. How different would the world have been. It’s an interesting concept. So I really enjoyed reading about how close the battle was, how easily it could have been turned in Napoleon’s favour or how he most certainly would have triumphed if the Prussian’s didn’t arrive to back the British. I find Napoleon an immensely interesting historical figure, and I would have liked the narrative to focus on him a little more though I think that’s my own bias speaking. Next year I intent to read Napoleon the Great by Andrew Roberts which I’m really looking forward to sinking my teeth into. Cornwell’s skill as a novelist came through when he was piecing together the narratives and journal entries of common soldiers together, told side by side with the larger scale details of the battle. And as such it felt like a full image of the battle was captured here. The illustrations are also fantastic and really help to bring everything to life. It’s a fantastic looking book, I recommend the hardback version because it looks and feels so much better. With his first nonfiction book, novelist Bernard Cornwell has done an admirable job of telling the story of the Napoleon’s ultimate defeat. While breaking no new ground, the author does an excellent job of telling the story of the campaign, including the battles of Quatre Bras and Ligny that were fought immediately prior to Waterloo. In telling of the battle of Quatre Bras, Mr. Cornwell does a good job of telling why Quatre Bas was important and why Wellington decided to defend it. It was a cros With his first nonfiction book, novelist Bernard Cornwell has done an admirable job of telling the story of the Napoleon’s ultimate defeat. While breaking no new ground, the author does an excellent job of telling the story of the campaign, including the battles of Quatre Bras and Ligny that were fought immediately prior to Waterloo. In telling of the battle of Quatre Bras, Mr. Cornwell does a good job of telling why Quatre Bas was important and why Wellington decided to defend it. It was a cross road that allowed quick communication between Wellington and Blucher. He illuminates the mistakes the Napoleon and his field commander Marshal Ney made that allowed Wellington to successfully withdraw his forces to their positions at Waterloo. In his telling of Ligny, I think Mr. Cornwell does the weakest job of the three battles. Even then, he does a good job of explaining Napoleon’s mistakes and why his failure to pursue and destroy the defeated Prussian army enabled his subsequent defeat at Waterloo. In his telling of the battle of Waterloo itself, I thought Mr. Cornwell did an excellent job of explaining the Rock/Paper/Scissors nature of Napoleonic warfare and how that affected the flow of the battle. He also does an excellent job of explaining the tactics and weaknesses of the various formations used by the armies. In addition Mr. Cornwell does a good job of highlighting the different leadership styles of Napoleon and Wellington. Wellington kept on the move and always seemed to be where he was needed to buck up morale and provide the needed decisions and leadership. Napoleon on the other hand stayed in the same spot the entire battle. He also does a good job of expounding on the inadequecies of the Dutch Crown Prince, William of Orange who was Wellington's second in command. In additon to the various generals, I felt he author did an excellent job of telling the story of common soldiers who made up the armies. He uses the diary accounts of the participants very well and gives good accounts of the main parts of the battle, ie the battles for Hougoumont and La Haye Sainte, the cavalry charges, and the final assault by the Imperial Guard. This is the second book of basically the same title written by Bernard Cornwell. The first is #20 in the Richard Sharpe series. Cornwell is one of the most respected writers of historical fiction. But here, he is a true historian looking at this pivotal battle in European history. 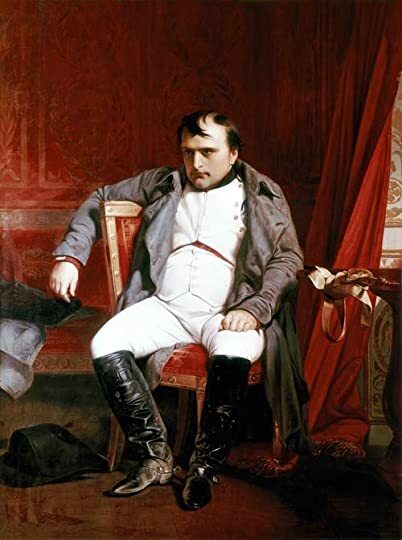 Unlike many of the Napoleonic Era battles, Waterloo was basically a hastily constructed battle between Napoleon Bonaparte (who desperately needed to his return to the French throne). And, the Allies, led by the Duke of This is the second book of basically the same title written by Bernard Cornwell. The first is #20 in the Richard Sharpe series. Cornwell is one of the most respected writers of historical fiction. But here, he is a true historian looking at this pivotal battle in European history. 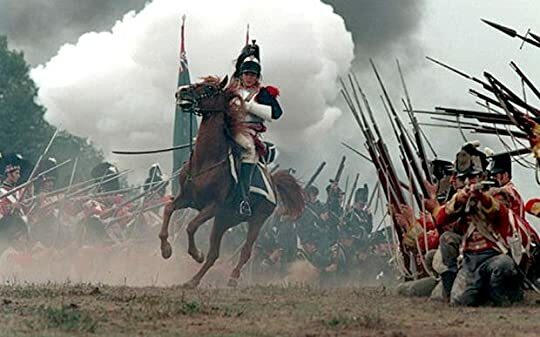 Unlike many of the Napoleonic Era battles, Waterloo was basically a hastily constructed battle between Napoleon Bonaparte (who desperately needed to his return to the French throne). And, the Allies, led by the Duke of Wellington and the Prussian Prince Blucher, who could not let Napoleon clear Europe of the only forces that could hold him in check. Albeit an extemporaneous battle, Waterloo, was a massive encounter using the three elements of that era’s military: cavalry, artillery, and infantry. In a world where millions can be killed by a single bomb, it is hard to put the battle losses in proper perspective. About 50,000 soldiers were killed or wounded and the majority of these were in close fighting. This was about 25% of all those engaged in the battle. Cornwell is a master of the battle’s details and he is meticulous in responding to the previous military historians who have offered their opinions. His take is not a unique one, but he marshals many facts in support of it. Wellington is not an altogether sympathetic leader. His connection with his troops was not an intimate one, but it is one where his example was sufficient to inspire his troops to follow him anywhere. There has been much criticism of Napoleon and an equal amount of rationalization. Cornwell does as good a job as I have seen in winnowing the wheat from the chaff. The same may be said of the wide variety of historian opinion about the Prussians under Blucher. For a non-fiction title, this was a riveting and moving read that was not only not dry, but actually managed to transport me like fiction to that shudderingly brutal time and place. As much as there are various military terms and jargon that were confusing to me (not surprisingly), that didn’t take away the enthralling effect the book had on me. Cornwell’s lucid description of the terrain of the battlefield at the beginning gives a presentiment of what might later prove to be obstructive or facil For a non-fiction title, this was a riveting and moving read that was not only not dry, but actually managed to transport me like fiction to that shudderingly brutal time and place. As much as there are various military terms and jargon that were confusing to me (not surprisingly), that didn’t take away the enthralling effect the book had on me. Cornwell’s lucid description of the terrain of the battlefield at the beginning gives a presentiment of what might later prove to be obstructive or facilitating to the British/Dutch army and the Prussian and French armies. The actual battles were fought from July 15 (Thursday) to July 18 (Sunday), 1815, and the minute details of the armies’ strategies and engagements are mostly told from vivid eyewitness accounts, interwoven with the author’s own views of “what-ifs”. One interesting observation the author makes is the similarity of natural circumstance between the Battle of Azincourt (1415) and the Battle of Waterloo (1815), that is, the rainy weather that turns the battlefield into a big muddy quagmire in both cases. Also, as noted by the author, in both of these fate-changing battles for France and England, the French Army’s outnumbering their enemy is of no help to the former, implying superhuman valiance of the latter. I happened to have earlier read Cornwell’s Azincourt, and understood what he meant. But I was well aware of the fact that history is written by the victor. An engaging and well paced book that has the hallmarks of Mr Cornwell's ability to construct stories against one of Europe's most famed and important battles. In essence this is a book only about the battle: the armies and the three battles over the four days. The background and lead-in is brief but enough for most readers who then are taken into the camps of the three armies and their movements as they build into clash of armies. For the seasoned Waterloo student or Napoleonic expert Mr Cornwell' An engaging and well paced book that has the hallmarks of Mr Cornwell's ability to construct stories against one of Europe's most famed and important battles. For the seasoned Waterloo student or Napoleonic expert Mr Cornwell's book probably adds little new. However, for readers such as myself who have only dipped in lightly this is a good starter s events, characters and outcomes are all placed and described well. I would also suggest for those who perhaps have little understanding or experience of military formations it is also easy to get to grips with as Mr Cornwell recognises not every reader will be a "Sharpe" aficionado or military buff. Finally, the publisher must also take great credit*. The colour prints, almost all of paintings of the commanders, men and battles, as of superb quality. This provides excellent visual material throughout at the end/start of each chapter but also allows one to then review scenes and passages the author has just delivered. In short then, if you are looking for a balanced, informative and easy to read one-volume account of this most notable of battles you will do well to start with Mr Cornwell's account. Only buy the hardback edition--this is a gloriously handsome book with at least 50 color plates/maps. Don't even think of buying in electronic form. Such "Saxon Tales" storytelling of a Napoleonic battle isn't for everyone--marred upon occasion by over-dramatic storytelling hardly necessary for the most consequential land battle of the first half of the 19th Century (and perhaps the entire Century). But it is a good basic introduction, with more maps than most modern works provide, and far more c Only buy the hardback edition--this is a gloriously handsome book with at least 50 color plates/maps. Don't even think of buying in electronic form. My prior familiarity with Waterloo came in two or three bios of Napoleon. So I'll have to read another to see whether the pattycake approach obscured fact. For me, the key insight was Cornwell's "scissors, paper, stone" analogy ("rock, paper, scissors" in North America) to Napoleonic land warfare: cavalry could attack infantry, whose defense was the square, which was vulnerable to artillery--but to win, the timing of the attack had to be perfect. Napoleon's and Marshal Ney's wasn't. I have a feeling this book will annoy more knowledgeable readers (and I see Aussie Rick already found a factual error). But a great into, and a wonderful reference for those of us old enough to have bookcases. "A few weeks before Waterloo [the Duke of Wellington] was walking in a Brussels park with Thomas Creevey, a British parliamentarian, who rather anxiously asked the Duke about the expected campaign. A red-coated British infantryman was staring at the park's statutes and the Duke pointed at the man. 'There', he said, 'there. It all depends upon that article whether we do the business or not. Give me enough of it, and I am sure." French officer Captain Pierre Cardon was summoned along with all the infantry regiment. The stood in two ranks "asking each other what was going on? What was there? In the end we were filled with worry. [Then, his Colonel appeared] holding in his hands, what? You would not guess in a hundred years. . . Our eagle, under which we had marched so many times to victory and which the brave Colonel had hidden inside the mattress of his bed. . . At the sight of the cherished standard cries of 'Vive l'Empereur' could be heard; soldiers and officers, all overwhelmed, wanted not only to see, but to embrace and touch it; this incident made every eye flow with tears of emotion… we have promised to die beneath our eagle for the country and Napoleon." "So Napoleon believed he could shove the Prussians further away, then switch his attack to the British. It was all going to plan and the Emperor would take breakfast in Brussels's Laeken Palace on Saturday morning. Except Ney had still not captured Quatre-Bras." "[T]he Emperor, alarmed, delays that attack until he can discover the identity of these newly arrived troops. They are his own men, but in the wrong place, so a messenger rides to d'Erlon ordering him to turn northwards and assault the Prussian flanks, but just then yet another courier arrives, this one from Narshal Ney, demanding that d'Erlon return to Quatre-Bras immediately. D'Erlon assumes that Ney is in desperate trouble and so he turns his Corps around and sets off a second time for Quatre-Bras. The Emperor has launched his great attack, but by the time he realizes d'Erlon is not engaged, the 1st Corps has vanished. Thus did those 22,000 men spend that Friday, marching between two battlefields and helping at neither. D'Erlon arrived at Quarte-Bras at sundown and his powerful Corps, which could have swung either the battle at Ligny or the fighting at Quatre-Bras, had achieved nothing. It is the French equivalent of the Grand Old Duke of York, except d'Erlon spend his day halfway between two fights, neither up nor down, and his prevarication denied Napoleon the crushing victory he expected." "At Ligny the Emperor had set a trap for Blücher, hoping that Ney or d'Erlon would fall like a thunderbolt on the Prussian right flank. The trap had failed. Blücher had hoped that Wellington would come to Ligny and so attack the French left flank, but that trap had also failed. Now a third trap was set. Wellington was the bait, Napoleon the intended victim and Blücher the executioner. It was dawn on Sunday, 18 June 1815,"
"Macdonell realized that the most important task was not to kill Legros [the French Sous-Lieutenant who axed-open the door to Hougoumont] and his companions, but to close the gate so that no more Frenchmen could enter. He led a small group of men past the intruders and together the forced the big gates shut, they heaved against the pressure from outside, some men shot through the slowly closing gap, and they ignored Legros's men who were fighting behind them. . .
Wellington once remarked that closing the gates [at Hougoumont] was the decisive act of battle and, later, when an eccentric clergyman wanted to arrange an annuity for 'the bravest man at Waterloo' and requested the Duke to make such a difficult judgement, Wellington chose Macdonnell. Macdonnell, in turn, insisted on sharing the money with Sergeant James Graham, an Irishman who had been at his side in those decisive moments, the pair did receive the annuity for two years before the generous clergyman lost his money, but it is significant that Wellington, forced to make a decision, nominated Macdonnell and, by association, Graham." "Napoleon now faces a dilemma. He has Wellington's army in front of him, but he must have known that a heavy force of Prussians was approaching to his right. He will be greatly outnumbered, yet he still insisted that he had a good chance of winning the battle. 'This morning we had ninety chances of winning,' the Emperor told Soult, 'we still have sixty.'" "French cavalry threatened, French infantry was on the ridge's crest and Marshal Soult was surely justified in thinking that victory was imminent. Duthilt's men might have been in disorder, but there were more battalions stacked behind his and sheer weight of numbers would push the redcoats back. And those redcoats were in line, and infantry in line was red meat to cavalryman, as the cuirasses had already proved on the Hanoverians whose slaughtered bodies lay thick close to La Haie Sainte. The British battalions would have to form square and, while that would protect them from cavalry, it would make them horribly vulnerable to French infantry volleys. Scissors, paper, stone. And then the cavalry charged. Only it was the British cavalry." "[T]hat was the great disadvantage of the formation the French had chosen to use. A column made of successive battalions in line looked magnificent and, given the chance, might have spread into a formidable line to give devastating volley fire, but it would take a battalion in a three-rank line a lot of time to form square,and they would be hammered by the battalions in front and behind while they did. There was neither space nor time to form square. Major Frederick Clarke, who charged with the Scotland Greys, reckons the enemy was trying to form square, but 'the first and nearest square had not time to complete their formation, and the Greys charged through it.' So the British heavy cavalry drove into the panicking columns and [Louis] Canler tells what happened: ' A real carnage followed. Everyone was separated from his comrades and fought for his own life. Sabres and bayonets slashed at the shaking flesh for we were too close packed to use our firearms.' . . .There was no time to form square, so his unit was cut to ribbons." "At first Ordener probably thought Ney was doing the right thing because, as his horse breasted the British-Dutch ridge, he saw 'the enemy baggage and massed fugitives hurrying along the road to Brussels,' and he saw abandoned artillery through which the horsemen had passed 'like lightning,' but then he saw something else. British squares. The British were not running away. Wellington was not disengaging and trying to withdraw his forces. Yes there were men and wagons on the road, but most of the British-Dutch army was still on the ridge and they were ready to fight. . . So it was horsemen against Infantry, and every cavalryman must have known what Captain Duthilt had written, that 'it is difficult, if not impossible, for the best cavalry to break infantry who are formed in squares', so while at first the cavalrymen seemed to have pierced the British-Dutch line, instead they were faced with the worst obstacle a horseman could encounter. The wide plateau of the ridge top was packed with squares, at least twenty of them, in a rough chequer pattern so that if a horseman rode safely past one square he was immediately faced with another, and then encountered more beyond. And each square bristled with bayonets and spat musket fire." "'The best of all France possesses,' General Foy said, watching in amazement as the cavalry rode again and again to its doom. 'I saw their golden breastplates,' a French infantry officer said of the curassiers, 'they passed me by and I saw them no more.'" "Marshal Ney's cavalry assault had been brave and hopeless, hurling horses and men against immovable squares. Those squares could have been broken by artillery if Ney had managed to bring more guns close to the line, or he could have destroyed them with infantry. That was the scissors, paper and stone reality of Napoleonic warfare. If you could force an enemy to form a square you could bring a line of infantry against it and overwhelm it with musket fire, and very late in the afternoon Marshal Ney at last tried that tactic, ordering 8,000 infantry to attack the British squares. . . Their task was to deploy into line and then smother the British squares with musketry, but the British would only be in square if the cavalry threatened and the French cavalry was exhausted. They had charged again and again, they had shown extraordinary courage and too many of them were now dead on the hillside. There was no charge left in them." "British infantry firepower had again shown its effectiveness and again the line had overcome the column. Eight thousand men had been defeated in seconds, blasted off the ridge by concentrated musket volleys and shredded by canister. The survivors fled down that terrible slope that was slick with blood, thick with dead and dying horses, and with dead and wounded men. It was littered with breastplates discarded by unhorsed cuirassiers running for their lives, and with scabbards because many of the French cavalry had pointedly thrown away their sword scabbards to show that they would not sheathe their blades until they had victory." "Meanwhile, a furious argument was raging between Lieutenant Colonel von Reiche, one of von Zieten's staff officers, and Captain von Schnarhorst. 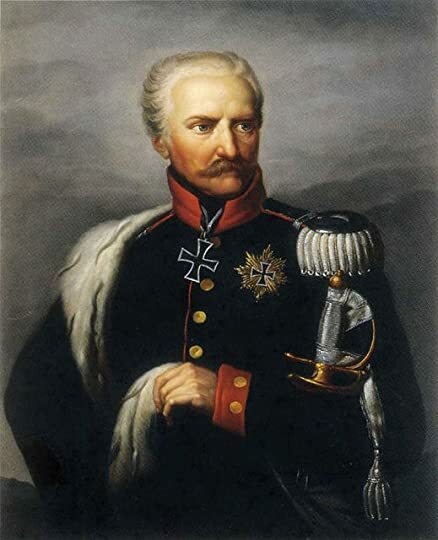 Von Reiche wanted to obey the original orders and go to Wellington's assistance, despite the report of the Duke's defeat, but von Schnarhorst insisted that Blücher's new orders [to turn south and join the main Prussian body] must be obeyed. 'I pointed out to him', von Reiche said: ' that everything had been arranged with von Müffling, that Wellington counted on our arrival close to him, but von Schnarhorst did not want to listen to anything. He declared that I would be held responsible if I disobeyed Blücher's orders.'. . . The troops had paused while this argument had raged, but then General Steinmetz, who commanded the advance guard of von Zieten's column came galloping up, angry at the delay, and brusquely told von Reiche that Blücher's new orders would be obeyed. The column dutifully continued marching eastward, looking for a smaller lane that led south towards Plancenoit, but just then von Zieten himself appeared and the argument started all over again. Von Zieten listened and then took a brave decision. He would ignore Blücher's new orders and, believing von Müffling's assurance that the Duke was not in full retreat, he ordered his troops onto the British-Dutch ridge. The Prussian 1st Corps would join Wellington after all." "The Imperial Guard was trying to deploy into line, but once again, as had happened so many times in the Peninsula, they had left it too late. The Brigade of Guards outnumbered and overlapped them, the musket balls were coming in front and from the sides, and when they tried to spread into a line they were beaten back by those steady, relentless volleys. . . Raw, badly trained troops oft n opened fire at far too long a range and then had a tendency to shoot high, but not the Brigade of Guards. They were shooting at a range where a musket could hardly miss, and their enemy, if he wanted to reload, had to halt, and then the ranks behind pushed him on, and so the Chasseurs fell into confusion and still those relentless volleys struck them and more men died. They were obstructed now by their own dead and wounded, and the Bregade of Guards was still firing until Lieutenant-Colonel Alexander, Lord Saltoun, shouted them forward. . . 'Now's the time, my boys! ', he shouted, and the Guarde leveled bayonets and charged. 'At that moment, Captain Reeve', another Peninsular veteran recalled, 'we charged them, they went to the right about and fled in all directions.'" "[Lieutenant Colonel Sir John Colborne] took the 52nd out of line. Half Colborne's men were Peninsula veterans, and they knew their business. Sir John marched his battalion forward, then wheeled it round so that his men faced the left flank of the Guard Chasseurs. . . They began firing volleys into the French flank so that the Imperial Guardsman were being attacked from their front and from their left. It was merciless. The Unbeaten were being killed by the Unbeatable. . . They did not just retreat, they broke. They had been beaten by British volleys and they fled that terrible musketry and when they fled so did the rest of the guard. And when they broke, so did the hopes of France." "Wellington rode back towards the centre of his line. Leeks had seen him just before the 52nd marched out of line to destroy and Emperor's dreams. The Duke's clothes, Leeke said, 'consisted of a blue sur tout coat, white kerseymere pantaloons, and Hessian boots. He wore a sword with a waist belt, but no sash.' The plain blue coat and black cocked hat made Wellington instantly recognizable to his men, and now, as the French began to flee, he watched from the ridge's centre fro a few moments. He saw an enemy in panic, a retreating enemy that was dissolving into chaos. He watched them, then was heard to mutter, 'In for a penny, in for a pound'. He took off his cocked hat and men say that just then a slanting ray of evening sunlight came through the clouds to illuminate him on the ridge he had defended all day. He waved the hat towards the enemy. He waved it three times, and it was a signal for the whole allied army to advance." "[It was about 10pm on June 21, in London when socialite Mrs Boehm 'walked up to the Prince, and asked whether it was his Royal Highness's pleasure that the ball should open. The first quadrille was in the act of forming, and the Prince was walking up to the dias on which his seat was placed, when I saw everyone without the slightest sense of decorum fishing to the windows, which had been left wide open because of the excessive sultriness of the weather. The music ceased and the dance was stopped; for we heard nothing but the vociferous shouts of an enormous mob, who had just entered the square, and were rushing by the side ota post-chaise and four, out of whose windows were hanging three nasty French eagles. In a second the door of the carriage was flung open, and, without waiting for the steps to be let down, out sprung Henry Percy -- such a dirty figure! with a flag in each hand, pushing aside every one who happened to be in his way, darting up stairs, into the ball-room, stepping hastily up to the Regent, dropping on to one knee, laying the flags at his feet, and pronouncing the words "Victory, Sir! Victory!" . . .
Of course, one was glad to think one had beaten those horrid French, and all that sort of thing; but still, I shall always think it would have been far better if Henry Percy had waited quietly till the morning, instead of bursting in upon us, as he did, in such indecent haste.'" "The battle of Waterloo was an allied victory. That was how it was planned and that was how it turned out. Wellington would never have made his stand if he thought for one moment that the Prussians would let him down. Blücher would never have marched if he thought Wellington would cut and run. It is true that the Prussians arrived later than Wellington hoped, but that probably contributed to the battle's success. If Blücher's forces had arrived two or three hours earlier then Napoleon might have disengaged his army and retreated, but by the time that the Prussians intervened the French army was almost wholly committed to the fight and disengagement was impossible. The Emperor was not just defeated, he was routed." Reading as a buddy read with Hana. We had both read An Infamous Army by Georgette Heyer & were keen to learn more. & I loved this lavishly illustrated book. I've never read any fiction by Cornwall, but I am certainly going to look for it now. Cornwall's writing style is very readable & approachable. I'm not a historian, so I like this. He wrote to his parents:"We had a magnificent affair against Napoleon today... it was my Reading as a buddy read with Hana. We had both read An Infamous Army by Georgette Heyer & were keen to learn more. He wrote to his parents:"We had a magnificent affair against Napoleon today... it was my corps which principally gave battle & to which we owe the victory." It is fairer to say the allied victory owed a great deal more to the French skirmisher who managed to put a musket ball in the Prince of Orange's shoulder. He also in mentions the scavengers that combed the battlefields robbing & sometimes murdering wounded soldiers. There is also the touching like the letter Major Arthur Heyland wrote to his family. Of course this book is about Wellington & Napoleon but Cornwall also lets Prussian Gebhard Leberecht von Blücher, Fürst von Wahlstatt shine. Who cannot admire a man who rode into battle at 72 years old & when visiting London later on said, "What a city to sack"
If anyone can recommend a book about Blucher in English I'd be grateful. Watching the 2015 Waterloo re-enactment on TV, I was very struck by how small an area they fought in. I found this picture from a 2009 re-enactment that gives an idea of the scale. Just a minor quibble. As a big Georgette Heyer fan I was hoping to read again about both Johnny Kincaid & Harry Smith. Both are in the book but only Kincaid is in the index. Hopefully this will be fixed in later editions. "Some battles change nothing. Waterloo changed almost everything." Two hundred years ago this year three battles were fought that altered the course of European history. For over 50 years Britain and France had fought each other for world dominance. But this fight was different. This time the European powers united in one of the first effective trans-national coalitions. The aim: to defeat an aging Emperor who had come back from exile to wage a new war. It was a cliff-hanger and right up until ni "Some battles change nothing. Waterloo changed almost everything." It was a cliff-hanger and right up until nightfall on that terribly long day, June 18, 1815, the outcome of the battle was in doubt. Lord Wellington said it:"It has been a damned nice thing—the nearest run thing you ever saw in your life." Bernard Cornwell's popular history of this great, horrible, brutal, near-run battle is simply splendid: brilliant storytelling, balanced, vivid first person testimony, lucid analysis, and characters major and minor who come alive (and all too often die). Cornwell's book is filled with helpful maps and battle diagrams, glorious portraits and paintings of battle scenes, and best of all, meticulous, absolutely clear descriptions of battle formations, maneuvers and tactics. Things that have always been a bit fuzzy in my brain suddenly came into focus. Wellington was a master of the 'reverse slope'. Very simply, that means he liked to conceal his troops behind a hill. At Busaco the British objective was to hold the high hill, but if Wellington had positioned his men on the crest, or on the forward slope, then they would have become targets for the deadly efficient French artillery. The Waterloo campaign is all about roads. Roads and crossroads. The armies needed the roads. Cavalry and infantry could advance across country without roads though their progress would be painfully slow, but guns and supply wagons had to have roads. Of course. But I never quite got so completely before. Thanks to Cornwell, I now have a much better grasp not just of Waterloo, but also much of European military history from the 18th century through to World War I. The roles that skirmishers, artillery, cavalry and infantry played in battle are now crystal clear to me, as are formations like columns, lines and squares. Yet if a column was psychologically powerful if also had two weaknesses. A column was desperately vulnerable to cannon fire and only the men in the outer two ranks and files could use their muskets. If a column has seventeen ranks of thirty men each, totaling 510 men, then only sixty in the first two ranks, and the two men on the outside of each rank, can actually fire at the enemy.. fewer than one quarter in all. This was a mixed bag for me. Starting with the good, as an idiot's (ie, moi) guide to the Battle of Waterloo, it was very good. Before reading it, all I knew about Waterloo, other than Wellington's winning it and Napoleon's being packed off to St. Helena, was dancing at the Duchess of Richmond's ball the night before and "The battle of Waterloo was won on the playing fields of Eton." This was compact and for the most part, engagingly told. I now have a clear sense of the various battles, stands, This was a mixed bag for me. Starting with the good, as an idiot's (ie, moi) guide to the Battle of Waterloo, it was very good. Before reading it, all I knew about Waterloo, other than Wellington's winning it and Napoleon's being packed off to St. Helena, was dancing at the Duchess of Richmond's ball the night before and "The battle of Waterloo was won on the playing fields of Eton." This was compact and for the most part, engagingly told. I now have a clear sense of the various battles, stands, and personalities, which is to the good. Frankly, I expected something by a writer of Cornwell's stature to be better written. The frequent shifts in tense drove me nuts. In addition, he repeated anecdotes and analyses (I remember it from the first time, thankyouverymuch) and had another writing tic of ending up a section with a one sentence (and sometimes a sentence fragment) paragraph. That staled quickly. His diction could have been improved. I do not think prevarication means what he thinks it means. I suspect Cornwell is one of those writers who is too big to be edited, alas. As I've said, I've no basis on which to criticize his historiography. My gut reaction says that Napoleon and Ney couldn't have been quite so incompetent as Cornwell portrays them, nor Wellington so god-like; it was a near thing, after all. It's a matter of the defects of its virtues, I suppose. I like footnotes, but this was clearly mostly compiled from secondary sources and his own vast store of knowledge about the period. Geared to the general reader, so lacking any real historical rigor. I thought the best parts, as in the most evocative, were the quotations from first-person accounts and the pictures; the book was worth reading for those alone. In a development that will surprise absolutely no one who is familiar with Cornwell's work, his first foray into non-fiction is fantastic. Cornwell seamlessly transitions from the novel to historical monograph, bringing all of his fiction-writing skills to bear to create the absolute best kind of narrative history. He's got story beats and cliff hanger endings. He's got amazing and flawed characters, at once heroic and identifiable. He doesn't give short shrift to scholarship. Waterloo is impecca In a development that will surprise absolutely no one who is familiar with Cornwell's work, his first foray into non-fiction is fantastic. He doesn't give short shrift to scholarship. Waterloo is impeccably researched, relying heavily on personal accounts from the combatants, carefully parsing reality from legend and always being willing to throw up his hands and say "I don't know." I absolutely cannot say enough good things about this book. Cornwell has managed to bring a fresh and fascinating perspective to one of the most well-studied (and well-documented) battles in modern history. If you shrug and say "we don't need another book on Waterloo," you are going to miss a treat. While reading Waterloo, you’ll discover that Bernard Cornwell has brought his considerable writing talents as a novelist to bear on this straight history of one of the most famous battles in the history of warfare. He skillfully ties together the story of three battles, (Ligny, Quatre-Bras, and Waterloo) three armies, (Allied, Prussian, and French) and the three commanders (Wellington, Blucher, and Napoleon.) Cornwell supplies plenty of facts and figures but he doesn’t let them overwhelm the nar While reading Waterloo, you’ll discover that Bernard Cornwell has brought his considerable writing talents as a novelist to bear on this straight history of one of the most famous battles in the history of warfare. He skillfully ties together the story of three battles, (Ligny, Quatre-Bras, and Waterloo) three armies, (Allied, Prussian, and French) and the three commanders (Wellington, Blucher, and Napoleon.) Cornwell supplies plenty of facts and figures but he doesn’t let them overwhelm the narrative of the story that he is telling. He makes the point, more than once, that trying to tell the history of a battle is like trying to tell the history of a ball. So many things are happening at once while at the same time there are very discreet elements. Cornwell excellently weaves those elements together while ensuring that you don't lose sight of the dance. I read this as an audiobook. The narrator, Dugald Bruce, was very good. Bernard Cornwall narrates the forward, preface, and afterword. 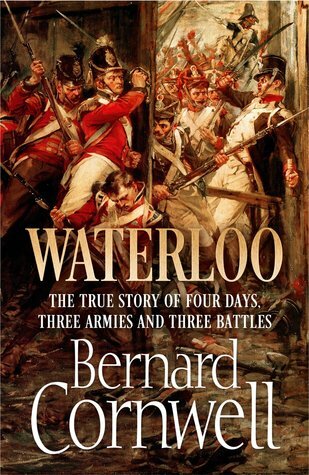 For the 200th anniversary of the battle of Waterloo, Bernard Cornwell published a non-fiction book on the subject. A number of years ago he had written a historical fiction book about There is nothing dull about this book; I could not put it down. Cornwell used his novelist skills to tell the story of Waterloo through the words and experience of the soldiers’ letters, diaries and memoirs. He brought the battle to life from both the French, British, Dutch, Flemish and German soldiers’ viewpoints. Cornwell did an enormous amount of research preparing to write this book. He used diaries, letters, memoirs, military records and reports as well as newspaper reports. The author helps clarify the complex battle for the non-scholar. It would be great to read this book just before visiting the Waterloo site. I read this as an audiobook downloaded from Audible. I am going to buy the hardcover edition for the maps and pictures. Dugald Bruce Lockhart narrated the book. Review for audiobook ~ 3 stars story ♫ 5 stars narration. I liked it well enough. I did learn a lot about Waterloo with this book. I was pretty amazed to learn that when this battle was fought, Napoleon was already in exile and this was his attempt to regain power. If he had just stayed put, there wouldn't have been so many lives lost. The brutality of the war was a bit depressing. There was quite a bit of gory details that made me sad. I could have done without detailed accounts of the death and Review for audiobook ~ 3 stars story ♫ 5 stars narration. I liked it well enough. I did learn a lot about Waterloo with this book. I was pretty amazed to learn that when this battle was fought, Napoleon was already in exile and this was his attempt to regain power. If he had just stayed put, there wouldn't have been so many lives lost. The brutality of the war was a bit depressing. There was quite a bit of gory details that made me sad. I could have done without detailed accounts of the death and mistreatment of the horses... In the audiobook I was unable to skim past those sad, and awful parts. I give it 3 stars as it was well detailed on both sides of the battle. Crec que és el llibre que més m'ha durat a la tauleta de nit, en tota la meva vida. No perquè no m'hagi agradat, sinó tot el contrari. Me'n vaig llegir la meitat d'una glopada, i després vaig decidir anar intercalant lectures. Durant dos anys i mig. Fins que l'he reprès i n'he enllestit l'altra meitat en una setmana. Mai va arribar a la prestatgeria. Mai vaig dubtar. Mai vaig desar-lo a la meva biblioteca per un altre moment. Ha estat tot aquest temps a la tauleta de nit, esperant el seu torn. I Crec que és el llibre que més m'ha durat a la tauleta de nit, en tota la meva vida. No perquè no m'hagi agradat, sinó tot el contrari. Me'n vaig llegir la meitat d'una glopada, i després vaig decidir anar intercalant lectures. Durant dos anys i mig. Fins que l'he reprès i n'he enllestit l'altra meitat en una setmana. Mai va arribar a la prestatgeria. Mai vaig dubtar. Mai vaig desar-lo a la meva biblioteca per un altre moment. Ha estat tot aquest temps a la tauleta de nit, esperant el seu torn. I ha valgut la pena, perquè és un assaig monumental i extraordinari sobre la batalla de Waterloo, l'abans i el després, però sobretot el durant, tots els fets bèl·lics i extremadament violents que van marcar el destí d'Europa. L'allau de noms i dades és anorreador, però Cornwell els empra amb saviesa per construir una novel·la coralíssima i emocionant, plena de detalls corprenedors. Cornwell’s Waterloo: The History of Four Days, Three Armies, and Three Battles begins with the return of the five-foot-six thorn in the side of Europe’s monarchies that was Napoleon’s return from his first exile on Alba. We rapidly move through his re-acquisition of France’s military might and the scene in which his soon-to-be opponent Arthur Wellesley is informed of Napoleon’s return. I did find it funny that so many British officers and soldiers were so stoked at the news. I can only imagine t Cornwell’s Waterloo: The History of Four Days, Three Armies, and Three Battles begins with the return of the five-foot-six thorn in the side of Europe’s monarchies that was Napoleon’s return from his first exile on Alba. We rapidly move through his re-acquisition of France’s military might and the scene in which his soon-to-be opponent Arthur Wellesley is informed of Napoleon’s return. I did find it funny that so many British officers and soldiers were so stoked at the news. I can only imagine they were less happy about the situation after the massive bloodletting that was the Waterloo campaign. We quickly cover Napoleon’s march north into Belgium with the aim of wedging himself between the British-Dutch and Prussian armies and defeating them in detail. This includes the lead-up battles at Quatre Bras and Ligny. Both are interesting stories in and of themselves but the meat of the book has to do with Wellington’s stand at the ridge of Mont-Saint-Jean, where the British-Dutch army fought for many grueling hours in an attempt to stave off the repeated French assaults on their position before the Prussian army under Blucher could arrive on their flank and make their position a much stronger one. As always hindsight is 20/20 but Cornwell still manages to work up a good amount of tension as the battle never seemed to be an obvious win for either side until the matter was decided. All of the famous episodes of the battle here are covered in bloody detail with plenty of firsthand accounts: the vicious fighting at the two farmhouses of Hougoumont and La Haye Sainte, the repeated attempts by French infantry to storm the ridge, Sergeant Ewart’s bloody capture of an Imperial Eagle, Marshal Ney’s ill-fated cavalry charge, and the climactic advance of the Imperial Guard. Anyone who knows Cornwell knows that he writes the hell out of combat stories whether it be cannon and musket or spears and shield walls and this book is hardly an exception. You can almost choke on the smoke from the muskets and artillery and you will certainly feel for the poor men (and women!) who were horribly wounded or killed in the fray. The pathos extends to the thousands of poor horses were killed or maimed and there was even a truly heartbreaking vignette about a poor kitten who was frightened out of Hougoumont and killed in the fighting. First person accounts of the horrendous carnage and devastation caused by accurate French artillery on British/Dutch squares. The steadfastness of British veteran units of Wellington's Peninsular Campaign especially on the last day of the battle, were a key to victory since the Duke considered the French troops he faced superior to the mostly green, untested troops under his command. Dug in British infantry was considered by French generals to be "immovable" while French Imperial Guard units were, until Waterloo, undefeated. They met on the last day of the battle and ultimately determined the final outcome. Highly recommended military history by the master, Bernard Cornwell. Lo que nos cuenta. Aproximación a la batalla de Waterloo, previa localización del lector en el momento histórico, en las dos batallas previas y absolutamente relacionadas con el posterior desarrollo de Waterloo. Cornwell is an entertaining writer, and even though book is not fiction, it still has that appealing air. There is a mistake about one of Napoleon's commanders, but that was minor considering the scope of the book and the campaign. Good in depth history of the battle. I actually learned quite a bit. Thoroughly enjoyed this book, cover to cover. Some say it can be a bit simplistic in the way it tells the story of the battle, but I think that’s what I liked most about it. War nonfiction can, on occasion, tend toward mundane detail of which only the writer truly knows what the hell he’s writing about. While there was some of that here, it wasn’t near as extensive as usual and was conveyed in such a manner that it was easy to follow. Spoiler: Napoleon loses at the end. Waterloo: The History of Four Days, Three Armies, and Three Battles by Bernard Cornwell is Cornwell's first venture into non-fiction. The author, best-known for his historical fiction (including the Sharpe series as well as the ongoing Saxon Chronicles, and numerous other excellent pieces of work), manages to combine the clarity of prose of the novelist with the myriad details of the historian, serving up a rousing, reader-friendly account of the famous battle that brought the Duke of Wellington Waterloo: The History of Four Days, Three Armies, and Three Battles by Bernard Cornwell is Cornwell's first venture into non-fiction. The author, best-known for his historical fiction (including the Sharpe series as well as the ongoing Saxon Chronicles, and numerous other excellent pieces of work), manages to combine the clarity of prose of the novelist with the myriad details of the historian, serving up a rousing, reader-friendly account of the famous battle that brought the Duke of Wellington head-to-head with the Emperor Napoleon in a quiet Belgium valley. Cornwell wastes little time on background players, pulling together a quick overview of the circumstances that led to the battle, outlining Napoleon's flight from his exile in Elba, the rallying of the French forces, the seizure of Paris and the subsequent shock the Hundred Days sent through his enemies, to galvanize both the British and the Prussians. He wastes little time on the politics and focuses mainly on the circumstances and events that propelled Napoleon and his armies into Belgium, to hammer at the seam between the two allied opposing forces, the British under Wellington, and the Prussians under Blucher. This then was the first battle of the title - Quatre Bras - which saw a piecemeal British and Dutch-German force hold (temporarily) a vital crossroads linking the two allied armies. Cornwell demonstrates his considerable acumen in providing readers with an accurate, clear picture of why the crossroads mattered to the Prussian-British forces, and what were the vagaries of war that prevented Napoleon from seizing a critical juncture in a timely fashion. The second battle is the oft-overlooked Battle of Ligny, which saw the Prussian forces pushed back in a bloody vicious see-sawing fight. Cornwell pulls together the various tactical and strategic threads into a cohesive and understandable picture of the situation - the retreat of the Prussians, the opportunity it opened for Napoleon, and his failure to properly capitalize on it. The final battle (and the meat of the book) was Waterloo. Aficionados of military history will find little new or substantially different in anything Cornwell has written. The Battle of Waterloo has been re-treaded so frequently that most of the controversies that tend to tie historians in knots are often of little consequence to the typical reader. Cornwell is uninterested in shedding any additional light on history, and is more focused on providing a concise, clear and well-documented account of all the major set-pieces made famous in the battle. He lays out a very good descriptive account of the battle, the players, circumstances and tactics utilized by both British and French troops, delves into the personalities of both Napoleon and Wellington and the many subsequent supporting players who played critical roles in what Wellington referred to as "a near run thing. The nearest run thing you ever saw in your life." Where Cornwell excels is his focus on the experience of the battle through the eyes and position of the common soldier. He discusses the limited view most men had of the battlefield, and the subsequent distortions in accounts that are then magnified over time, politics and memory. Overall Waterloo: The History of Four Days, Three Armies, and Three Battles is a rousing and gripping, if unsophisticated, look a the battle of Waterloo. A critical, detailed, in-depth study of the battle and the history, it is not, but as a generalized account, it is excellent. It is a solid, well-told look at a critical battle that re-shaped the history of Europe. To meet one’s Waterloo, has become almost a cliché, a byword for meeting one’s final or ultimate defeat. 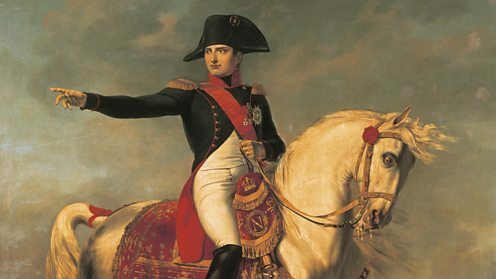 The term, as well as all of the cities and towns named Waterloo, come from one singular battle – the place where Napoleon Bonaparte met his own personal and political Waterloo at the hands of the Duke of Wellington. Today, June 18, is the 200th anniversary of that battle. While a cannon’s weight of books have been published this year to commemorate the bicentennial of the Battle of Waterloo, I wanted to pick just a couple to hopefully expand my understanding of what happened that day. It is a difficult thing for an author, any author, to build excitement and anticipation into a story where we already know how it ends. Wellington won, Napoleon was finally and ultimately defeated. The story of the Battle of Waterloo, at least as told by Bernard Cornwell, is a story where we know the ending, more or less, but it is the middle that is obscured, both at the time and even 200 years later. Or perhaps especially 200 years later, as there has been plenty of time for myths, legends, obfuscations and half-truths to find their own little corner of that field. As the battle was taking place, a lot of the confusion can be blamed on the fog of war. In that battle, and in that era, it was at least partially a real fog, the smoke from the hundreds of cannons and howitzers, and from the tens of thousands of muskets, all seemingly firing at once at obscuring the participants’ view of anything not immediately next to them. What we all know is that Napoleon escaped from his exile on the Island of Elba, was declared Emperor again, and marched on Brussels. He intended to retake Belgium, which had been severed from the French Empire after his earlier defeat. Wellington met him at Waterloo, and eventually defeated Napoleon after three days of bloody battle. Napoleon retreated, and finally surrendered to the British, who promptly exiled him to Saint Helena, where he remained until his death. This book of Waterloo is an attempt to bring coherence to all of the various eyewitness and survivor accounts of what was a long, hard-fought and ultimately confusing battle fought on multiple fronts by multiple armies over a lot of churned up and muddy ground. Everything was important, from the drenching rain and mud, to the stone farmhouses and barns that dotted the region, to the tempers of the commanders and the trust (or lack thereof) between the armies. Even the style of the various commands – where Napoleon led from the rear and delegated everything and Wellington, who seems to have led from everywhere at once and delegated nothing to Blücher, the Prussian general who came to Wellington’s aid, who fought while wounded and at the age of 73, pressing ever forwards in the midst of his men. The personal accounts are often humorous, in the sense of gallows humor that war brings out in both fact and fiction. Some of the survivor’s’ accounts contradict each other, as they each only saw or heard one tiny sliver of a massive campaign. Cornwell brings the disparate sources into a coherent whole, and gives even someone with only an extremely casual interest in military history and tactics a sense of what happened and why it happened. Even though I knew how it ended, finding out how they got there was fascinating. Escape Rating A-: Waterloo is a battle that was such a turning point in history that we all know how it ended. One of the things that this book does well is to make the reader see how easily it could have gone the other way. Actually, several other ways. One has the feeling that the contest turned out to be between Napoleon’s overconfidence and Wellington’s ability to pick his ground and utilize it to the fullest extent. Wellington found a place that he could defend, and then settled his troops in to defend it. We also see the fruits of the trust between Wellington and the Prussian General Blücher, which may have been unlikely (and one of Blücher’s aides hated Wellington) but saved the day. The descriptions of the way that artillery worked and how it did what it did give the reader an awful sense of just how deadly they were, even if they were damnably difficult to aim. I also finally understand the different infantry formations for the first time. The author describes the calculus of warfare as a deadly game of rock, paper, scissors, and the analogy works very well. This is not the only book this author has written titled Waterloo. In his Sharpe’s series, there is a fictional book Waterlooabout the battle and Sharpe’s participation in it. 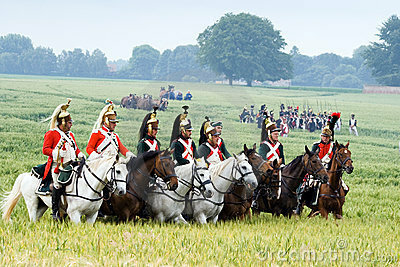 The Napoleonic Wars, including the Battle of Waterloo, have been used as a backdrop in fiction in virtually every genre. You may have read about the Napoleonic Wars and Waterloo without even realizing it. In science fiction, David Weber’s Honor Harrington series is the Napoleonic Wars as fought between star empires. In Naomi Novik’s Temeraire, the Napoleonic Wars are fought with dragons. In C.S. Harris’ Sebastian St. Cyr series, the titular character finds himself aiding the police as a way of dealing with his own PTSD after Waterloo. Stephanie Laurens’ Bastion Club features a group of men who were English spies in France during the Wars, and now that the war is over, have discovered that one of their greatest foes is operating in England. Last, but certainly not least, the Aubrey/Maturin series by Patrick O’Brian details a naval officer’s career during the heady years of the Napoleonic Wars. So for even an inveterate fiction reader, Waterloo and the Wars that it ended have a tremendous influence on so many works that came after. Reading so many things that are set in or influenced by the era, it is easy to think that we know all we need to know. Actually I give it 4 and 1/2 stars. An excellent overall account of this fascinating event. A very good history of Waterloo, while still written in a very Bernard Cornwell adventurous style, with added colour from quotations from memoirs. Plus, I may have found a new relative! Easy to read study of one of history’s most important battles. Written for non-military types in a clear and concise fashion. Quite enjoyable. I’m not usually one to investigate the Napoleonic Era, but I’m happy to report that learned a lot about the history as well as why the heck they fought in those crazy formations! Now it makes sense. This is the first non-fiction book by Bernard Cornwell, but he brings all the talent that he has honed over the years in writing his many historical novels to retelling the story of Waterloo. It's worth mentioning up front that those who have read a lot of military history may be put off by the repetitiveness of some points that he want to drive home, e.g. the way that the Duke of Wellington would invariably position his forces on the reverse side of slopes to protect them from artillery fire. H This is the first non-fiction book by Bernard Cornwell, but he brings all the talent that he has honed over the years in writing his many historical novels to retelling the story of Waterloo. It's worth mentioning up front that those who have read a lot of military history may be put off by the repetitiveness of some points that he want to drive home, e.g. the way that the Duke of Wellington would invariably position his forces on the reverse side of slopes to protect them from artillery fire. He repeats this perhaps ten times at different times in the books. Notwithstanding the repetition, I found it a great read. Again, I think his skill in writing fiction that allows him to build suspense of this battle, even though you know the outcome. He starts his story as Napoleon has returned from exile and sees most of the French army join him. The action really gets underway as Wellington attends a ball in Brussels, where most of his senior officers are in attendance. The next day, the Allied army is underway, heading to a fateful encounter with the French forces near the small town of Waterloo. Several engagements happen over the next few days, beginning with Quatre-Bras. Wellington, with maybe only half of forces being of the quality that he needs goes into battle, knows that if Blucher doesn't arrive with his Prussian army, he probably will lose the battle to Napoleon. And he had hoped never to fight Napoleon. The suspense continues to build. The battlefield action is terrible, and it is well worth reading to fully comprehend what war really meant back then. You will understand how the battle was won by the British and Prussians and how it was lost by the French generals. In the end, you will come to understand why Cornwell says that Napoleon was worshiped by his men, Blucher was loved by his, but Wellington was only respected by his. One of the closing scenes has Wellington crying as he read over the casualty list of his officers. It is a book that I will heartily recommend to anyone who wants to understand how the battle of Waterloo was fought and what it meant. Trying to tell the history of a battle is like trying to tell the history of a ball. That's a paraphrase of one of the quotes of a participant in Waterloo and it's accurate. But Cornwell does a superb job of getting as close as possible in this book. Honestly I'm surprised by how much I enjoyed this book. It's well written, engaging, interweaves different viewpoints and concurrent narratives and still manages to be informative and comprehensive. There are two great advantages of this book. First Trying to tell the history of a battle is like trying to tell the history of a ball. That's a paraphrase of one of the quotes of a participant in Waterloo and it's accurate. But Cornwell does a superb job of getting as close as possible in this book. Honestly I'm surprised by how much I enjoyed this book. It's well written, engaging, interweaves different viewpoints and concurrent narratives and still manages to be informative and comprehensive. While Bernard Cornwell has written many historical novels, he is perhaps best known as the creator of Richard Sharpe: the Rifleman fighting in Wellingtons armies throughout the Napoleonic Wars (and portrayed on TV by Sean Bean). While he is also known for carrying out research into the events that his novels are based around, it is perhaps somewhat surprising that - until now - he has produced any works of non-fiction. For his first, he has taken the subject of the Battle of Waterloo in 1815, the While Bernard Cornwell has written many historical novels, he is perhaps best known as the creator of Richard Sharpe: the Rifleman fighting in Wellingtons armies throughout the Napoleonic Wars (and portrayed on TV by Sean Bean). For his first, he has taken the subject of the Battle of Waterloo in 1815, the battle that ended both the Napoleonic Wars and Napoleons ambitions, when he was defeated by the combined might of Wellington Anglo-Dutch army and Grouchy's Prussians. With each chapter of the book named after a quotation about the events covered in that chapter, and with numerous eye-witness accounts reproduced (not to mention the maps preceding each chapter, or the - in some cases, full page - paintings at the end), it is interesting to see how his prose style carries over from fiction to non-fiction. I don't know (but doubt) whether this will replace any of the more scholarly (mostly dry) works on the battle, but I found this to be a thoroughly readable and interesting introduction to the events of June 1815.